When it comes to waterfalls Costa Rica is full of them. You always have the option of visiting the beautiful but touristy La Fortuna Falls. But many look for the not so touristy waterfalls and what many people don't realize when they are touring Costa Rica is that most of the waterfalls no tourist will ever see. 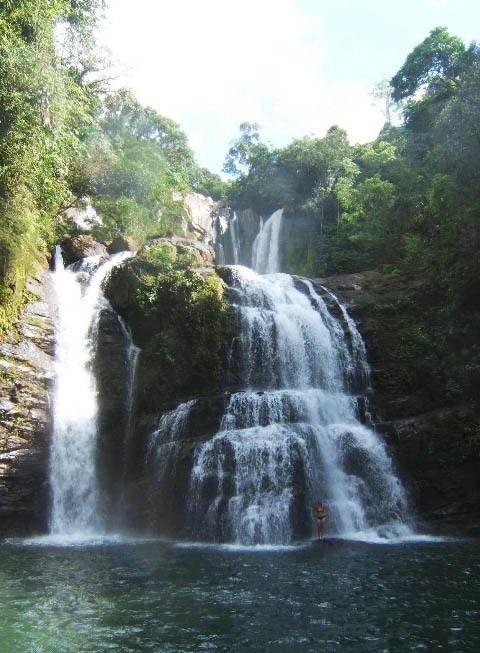 For example some of the most spectacular waterfalls are found in Braulio Carrillo National Park which would take you just a week hiking, climbing, and camping to get to the waterfall so your week long Costa Rica family vacation would be finshed before it even started. Although if you want to visit a waterfall that is off the touristy path, hidden in the jungle, and absolutely breath-taking then there is one that comes to mind. The waterfall on the commerical level and guide books is called Nauyaca Falls. We like to call it Baru Falls which was the name given by the Indians. There are few different ways to get to this double-decker 300ft waterfall. The first being to hike to the falls. This is a beutiful hike. You can begin from the main road between San Isidro and Dominical. The hike depending upon where you begin from can take around 1 1/2 hours. The second way to get to the falls is by horseback. There are a couple of tour operators that do the horseback ride to the falls the most common being Don Lulu's ride which has an amazing lunch but this is often crowded. The third option which happens to be the option of our company CRR is to arrive to the top of the falls in an SUV and then rappel down the waterfall. It is quite exciting to get to the top of the 300ft and tell the tourist OK now we throw the ropes and hook on to this tree and rappel down. All they hear is the thundering sound of rushing water. This is a more intense experience than the canyoneering trips that they operate in La Fortuna Arenal Volcano area. The waterfall is literally 20 times the size of the waterfalls that you rappel in a canyoneering trip. Take a look at the videos on this entry so you can see the difference and also experience the amazing rappel and beauty of Nauyaca (Baru) Falls Southern Zone Costa Rica. Cheapest parking near London City Airport offers were a high quality material. My experience was a very pleasant one. Everybody was nice and it was fast and smooth….